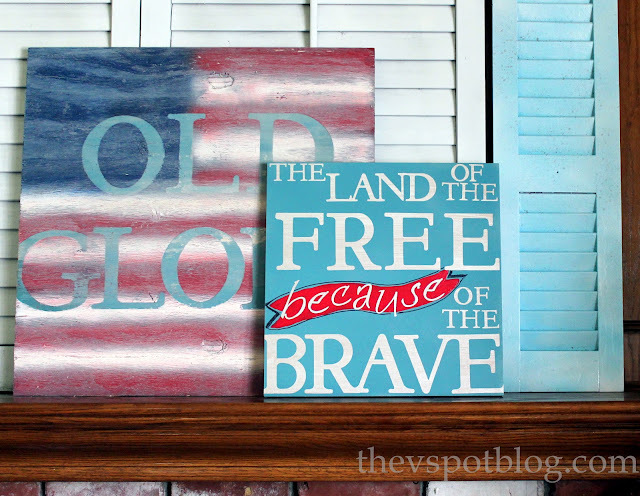 Yesterday I shared some quick, DIY spray paint artwork for the 4th of July. I have to thank Michele at The Scrap Shoppe for the inspiration. 2. Flipped it over and painted the wood with a pearlized white acrylic paint. 3. Cut out adhesive letters using contact paper and my Cricut. 4. Adhered the letters after employing my favorite letter placement technique: The Eyeball Method. 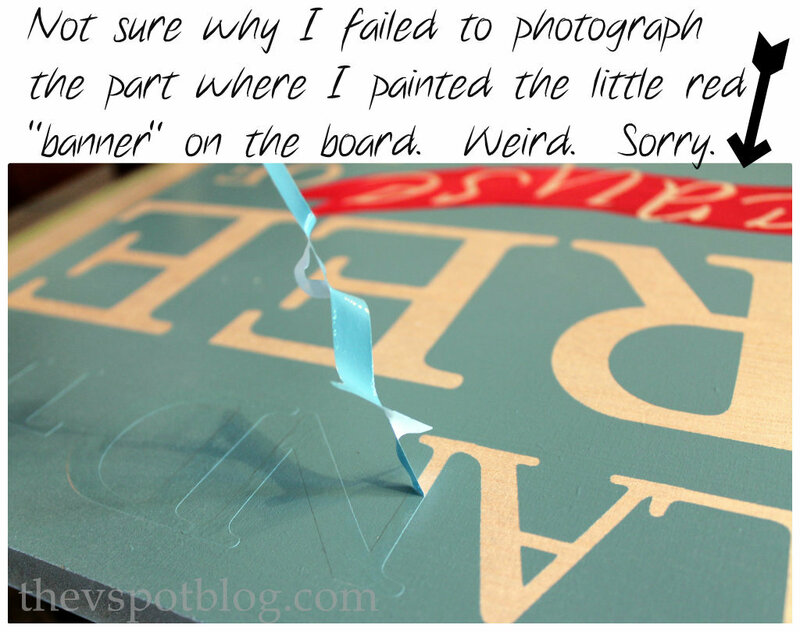 When the letters were adhered to the board, I sprayed it with a turquoise paint. The next step is to peel off the letters. Any how, this was quick, easy and I like that I can re-use the other side of a seasonal art project. Do you ever make your decor do “double-duty”…? Love you piece…..and well said. Its beautiful, Viv! They both are. Thanks so much for the shout out! That’s one of my favorite patriotic phrases. 🙂 Happy 4th!! OH! I love this one most of all! This is a great quote for the 4th. I wish I had made a printable with it. Next year. This is an super great idea lady! 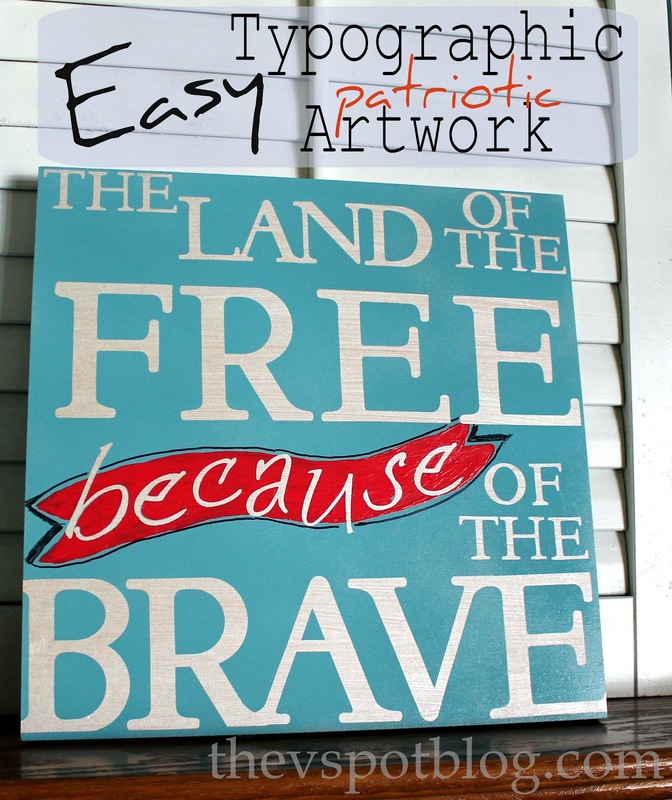 Thank you so very much– Happy 4th!! love this sign Viv! I’ve yet to make signs using my cricut. This is very pretty, and I like the “different” blue in the red, white, and blue. But I mostly had to leave a comment because when I got to #4, I was so excited that I was about to learn a special technique for letter placement… I literally laughed out loud at your “method” used! You have been pinned. Saw you at Debbies. I shared this on facebook the other day and now am pinning it. Stopping by from Debbiedoos and Fox Hollow Cottage pin party. You have been pinned saw you at Debbiedoos,love this sign,and soooo true too. Ah, the old eyeball method – my favorite! I’m not a measuring kind of gal! Love the sentiment – hope you had an amazing 4th! (and glad you got your yo-yo’s)!! Love it! Artist you are!!! Making art with what you have. Thank you for the ideas. One more great way to use my Cricut! Have a blessed July and thank you for honoring the Brave who serve us! Red Faux (“Daux”) Coral – Easy coastal decor made from salt dough.